All across the country, kids are eyeing wrapped presents, shaking boxes under the tree, or going over and over their hand-written wish lists. It’s easy for kids to get caught up in the WANTS of the season and completely neglect the joy of giving. If there is one thing that I want to instill in my children, it is the spirit of giving. I know some children have this natural gift, but others need a little nudge in the right direction. 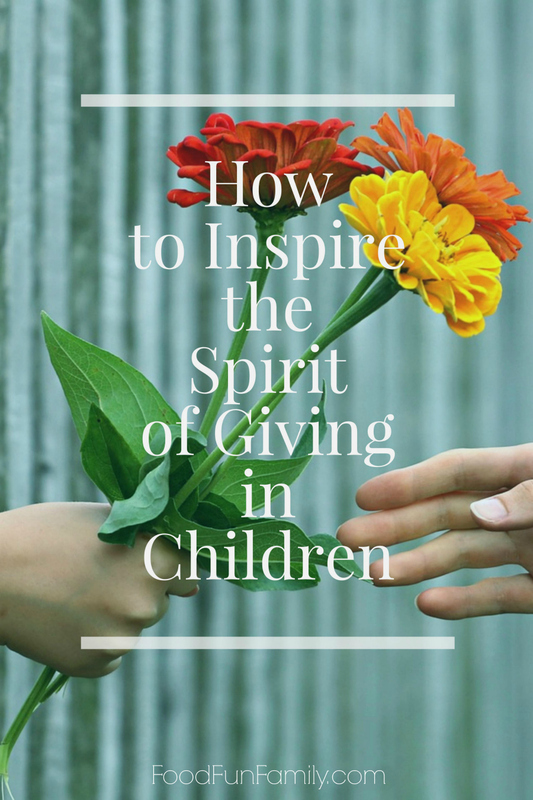 Here are a few ideas on how you can inspire the spirit of giving in children. Did you know that most people learn by seeing? Your kids are going to be inspired by seeing you give. Whether you do a random act of kindness of help someone in your family, let your children see you give. While it may not inspire something in them that very minute, they are watching! One thing I’ve noticed about children is that they want to do good things, but are not always given the opportunity. When it comes to inspiring the spirit of giving in children, give them the opportunity. Expose them to situations in which they can see a need. Don’t just tell your kids what they are going to do. Let them make the choice to give. Maybe your kids don’t understand what giving is. Perhaps they don’t understand that there are people out there who go without. The only way your children can learn about this is by showing them. Talk to your kids about the value of giving. After they’ve had the experience of giving, talk about the good feelings they had while helping someone else. As a parent, you are always planting seeds in your kids (whether you want to or not). If you want to inspire the spirit of giving in them, keep planting that particular seed. What you teach them now, they will use down the road. Keep looking for opportunities to show your kids the value of giving to others. You can teach them that being materialistic and collecting “things” will only get you so far. A spirit of giving is a blessing to everyone – to the person being given the gift as well as the person giving it! I know that inspiring the spirit of giving in children starts at home. Doing service acts as a family can help instill this in your children. Serving in a soup kitchen, delivering a meal to a neighbor, giving away items you no longer need can all instill the spirit of giving in your children. ‘Tis the season to give and give some more. How do you plan on inspiring the gift of giving in children? I have learned that giving is always better whenever your heart is truly in it! Do you agree? We teach my grandsons about giving by leading by example. We love to go to our local firehouse and give back to the firefighters and our community. We donate food/drinks to the firefighters and we love to give coloring books and stuffed animals for them to give out to children in need or who are scared. I love your ideas. It’s an important virtue to instill in our children! It is so important to reach out and help others this Holiday season. There are others that are not as fortunate and every little bit we help with really makes a difference. I teach my kids by example.